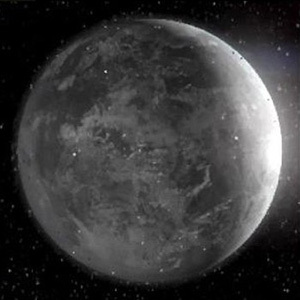 Rhen Var was a planet that had one moon and was situated in the Tion Cluster in the Outer Rim Territories. Throughout the history of the Galactic Republic, Rhen Var was covered in ice, rendering it almost uninhabitable. Remains of an ancient civilization and old Jedi artifacts were found beneath the ice on the planet, remnants of a former population. Rhen Var was once a fertile paradise filled with vegetation and wild life. Millions of years before the Clone Wars, an atmospheric cataclysm turned it into an icy hibernal surface. Since then, it had been a frigid world of frozen tundra and snow swept mountains. After the Great Sith War in 3,986 years before the Battle of Yavin, former Jedi Ulic Qel-Droma sought refuge on Rhen Var, and there trained Vima Sunrider. He ultimately found peace in the snowy wastes, and was redeemed prior to his murder by Hoggon. At the start of the Clone Wars in 22 years before the Battle of Yavin, the Confederacy of Independent Systems seized Rhen Var with an army so large that the Republic base had to evacuate the planet. Obi-Wan Kenobi informed the Jedi High Council about the seizure of the planet. The Separatists' motives were unclear as to why they took the world, until Kenobi and Anakin Skywalker discovered Count Dooku uncovering the Force Harvester on Raxus Prime. The answers to its power would be located in the tomb of Ulic Qel-Droma on Rhen Var. After the liberation of Alaris Prime, the Republic retook Rhen Var in the Battle of Rhen Var. During the battle, Anakin learned from Qel-Droma's Force ghost how to defeat the Force Harvester which would power the Dark Reaper located on the ancient Sith world of Thule.